Kitchen cabinets are a major investment, have a lot of function, and very important thing that should be available in kitchen. Kitchen cabinets don’t likely to be made again anytime soon. So, big consideration should be done. You can freshen up your cabinets and don’t have to buy the new one. Retaining or repainting, you can pick whatever color you wanted. Refacing, involves installing a new veneer on the exterior of the cabinet box and replacing the doors and drawer fronts, and should be handled by a professional. These processes are much faster than installing new cabinets because the cabinets remain intact and the work is done on-site. But, concern this, 50-70% of the cost of the cabinet is the door. So, if you're paying for someone to put a new door or a new drawer in, it might be more affordable to shop new." Well after you decide that you’re gonna install new cabinets, there are another things you should decide. Are custom cabinets required, or will stock cabinets fit the bill? Offer endless options with regard to materials, designs, finishes and accessories. The manufacturer produces them in predetermined increments. Space may be needed to conceal unused wall space, and that sacrifices storage. The range of materials, designs, finishes and accessories will not be as broad with semi-custom cabinets. Cost less than fully custom cabinets. The least expensive for a new cabinet options. It’s pre-made and come in standard sizes. Though stock cabinets often get a bad rap in terms of quality of construction, there are many on the market that are made of solid wood. No matter what type of cabinet is selected, it's important to evaluate the quality of hinges, doors, drawer systems and finish. You should choose cabinets that offer at least a five-year warranty. There’s front frame around the cabinet opening. The door attaches to the frame. The door attaches directly to the side of the cabinet. Often used in contemporary kitchens. There is open access to the cabinet interior because there is no front frame. Traditional-overlay doors cover some of the frame. 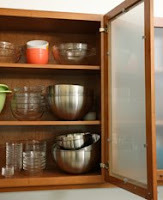 Full-overlay doors cover the entire cabinet frame. Inset doors sit inside the cabinet frame. Pull-out drawers for pots and pans, oversize drawers for baking sheets and designated cabinets for trash and recycling are some examples. Built-in spice racks, drawer organizers and other cabinet extras make the kitchen a much more efficient and enjoyable place. Add pulls, knobs and handles to cabinets. Hardware comes in a wide variety of styles at all price points and contributes to a truly customized look. How to Decide Which Kitchen Contractor to Hire? How Can I Get Goods Cheap for My Kitchen?